The bulges you see under your chin when you look in the mirror may negatively affect your personal sense of beauty and attractiveness, and may cause you some measure of distress. Men and women alike can suffer from a double chin. Being overweight contributes to the development of double chins, as can the elasticity lost in your skin as you age. This results in an extra fatty tissue layer under your chin. Genetic factors can also contribute to your having a double chin. You can seek out plastic surgery for a procedure that will get rid of your double chin, but they are expensive, and good results are not guaranteed. If you would prefer a budget-friendly, painless way to get rid of that double chin and its extra fat, our home remedies will help you. Green tea helps in increasing your skin’s elasticity. It contains numerous antioxidants that will fight against the free radicals that, among other things, are responsible for aging. This herbal tea also has anti-inflammatory properties that protect your skin from photo-aging. Green tea bags work well in massaging your skin, too. Wheat germ oil has vitamin E in it, which will boost your skin’s protection from the rigors of photo-aging. Before you go to bed, massage wheat germ oil into your skin in an upward motion for about 10 minutes. Leave the oil on overnight and wash it off well in the morning. 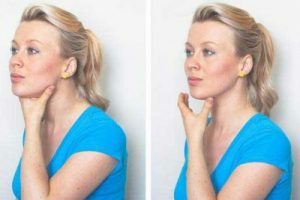 Do this regularly until you note improvement in your double chin. You can also eat foods that contain high levels of vitamin E. Soybeans, peanuts, seeds and nuts, brown rice, barley, beans, dairy products, legumes and leafy green veggies are all rich in vitamin E.
Alternately, you may apply the oil from a vitamin E capsule combined with water on the excess fat under your chin. Milk contains vitamin D and calcium. These will both help to defeat some of the rigors of skin’s aging. Moisturize your face using milk cream. Massage it for several minutes. This will help your skin to be more elastic, and tone your chin area. In addition, you can apply a mask made from milk and honey. This is beneficial to your skin. Rinse your skin with warm water after 10-15 minutes. This type of melon contains vitamin C. This will safeguard your skin from the effects of photo-aging. Make juice by peeling and grinding a melon. Apply the juice to your neck and face with a cotton ball. Massage it in gently and leave it on your chin and face for 15-20 minutes. You can add apple juice, too. Rinse your face and chin well. Eating melons also helps to restore a youthful complexion. Egg whites have protein, and this plays an integral role in the maintenance of your skin’s elasticity. Egg whites tighten the skin, in addition to reducing a double chin. You can make a DIY face pack from vinegar, egg white and Epsom salts. Apply the pack with a cotton pad and be prepared for amazing results in getting rid of your double chin. If you want to work at preventing a double chin, you also need to tone the muscles in your face. One easy way to exercise the jaw is by chewing sugar-free gum every day. This will also help in maintaining your healthy teeth and gums. Glycerin can help to improve your skin’s elasticity, which is why it’s used to help you determine how to get rid of a double chin. Simply combine one tablespoon of glycerin with a half teaspoon of Epsom salts and several drops of peppermint essential oil. Apply this pack on the neck and chin area to work at getting rid of excess fat. After several minutes, rinse your face, neck and chin well with warm water. You can repeat this treatment four or five times per week. Cocoa butter contains polyphenols. They reduce excess fat around the face and chin and work to improve your skin’s elasticity. Warm up several tablespoons of cocoa butter in your microwave. Gently massage this into your face. Repeat the mask two times per day. You can use it once before you shower in the morning and then before you go to bed at night. This is an agent that naturally moistens skin. The levomenol found in Chamomile possesses anti-inflammatory properties that will aid in maintaining the elasticity of skin. Olive oil has high levels of anti-oxidants that will safeguard your skin from free radical damage. Massage your chin, face and neck with warmed olive oil for 15-20 minutes in the morning when you get up, to keep the saggy skin from showing up as a double chin. The muscles in your neck can become loose, since they are not often used in exercise. This means that fat can accumulate in the area of the neck and chin, which leads to a double chin. 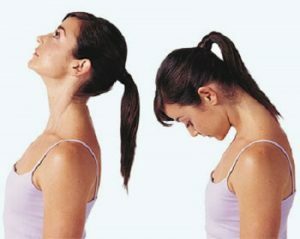 Do the neck rotation two times per day to get rid of double chins. The tongue press and other double chin exercises are helpful for getting rid of a double chin. This specific exercise is targeted to tighten your chin muscles, which will make your double chin slowly disappear. Stand still, with your neck and back straight. Raise your head and look up toward the ceiling. Lower your chin to your chest without rounding the upper part of your back. Return slowly to your original position by relaxing the tongue and straightening the neck. This exercise can be done pretty much anywhere. You can do it while standing or sitting. Form a pouty lower lip by pushing it out. It should look and feel just like it does when you’re actually pouting. Place one finger on the chin, making the skin feel wrinkled. Hold this position for several seconds. While your lips are still in the pouting position, lower the chin to the chest. Do not let your upper back lean at all. Hold the position for several seconds and then return to a regular sitting or standing position. You can perform two sets of 20 repetitions each. You can use a simple tennis ball for exercising the muscles and reducing a double chin. Take a tennis ball. Keep it on the neck, holding it tight with your chin. Press the ball firmly with your chin muscles. Repeat the exercise 10 times or more. This exercise exercises the muscles in your jaw. Sit straight up, moving your jaws up & down like you’re chewing, but keep the lips closed to stretch the chin muscles. As you do this, breathe in deeply and then exhale slowly. This exercise should take about a minute and a half to complete. Sit on the floor with your back straight. Keep one hand down, away from the hips. Raise your other hand gently and take it up slowly, wrapping it around the top of the head. Use your palm to press your head down towards your shoulder. Take your other hand off the floor and place it on your upper arm. Hold this position for about 10 seconds. Repeat with the arms doing the opposite motion from what they did the first time. Perform the exercise 10 times more. Lifting your head uses the muscles in your neck more. Lie down flat, face-up on a bed. Keep your neck at the edge of the bed. Contract the muscles in the front of your neck. Curl and then lift your head to the chest. Your shoulders must remain flat on your bed. Hold this position for about 10 seconds and then return slowly back to your starting position. Do three sets of two repetitions each. Take a break between reps so that you don’t become dizzy. Place your thumb under the jaw bone, on just one side of the jaw. Place an index finger on the other corner of your jaw in the same location and press it gently. Push forward slowly and then hold for 30 seconds. You should so three repetitions of this exercise one time per day. Use a pillow that is thin, rather than thick. Include cardio exercises and weight training. Eat a healthy diet, low in calories and focus on the foods you eat. Always sit and stand straight, keeping your neck muscles taut. While you massage your double chin, only use upward strokes. Do not use circular or downward strokes, or you may encourage wrinkles and sagging. Avoid carbonated drinks, alcohol, coffee and tea. Slouching may increase your double chin, and make it more permanent. Don’t slouch if you’re trying to get rid of a double chin.